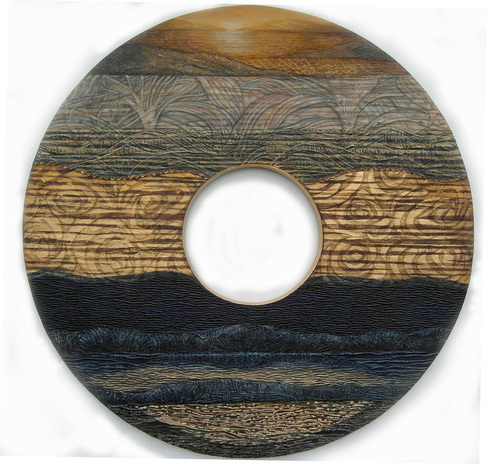 ﻿﻿﻿The perpetual movement of the tide is celebrated in this painting, with special attention paid to the ribbons and patterns that the tides create in the sand. 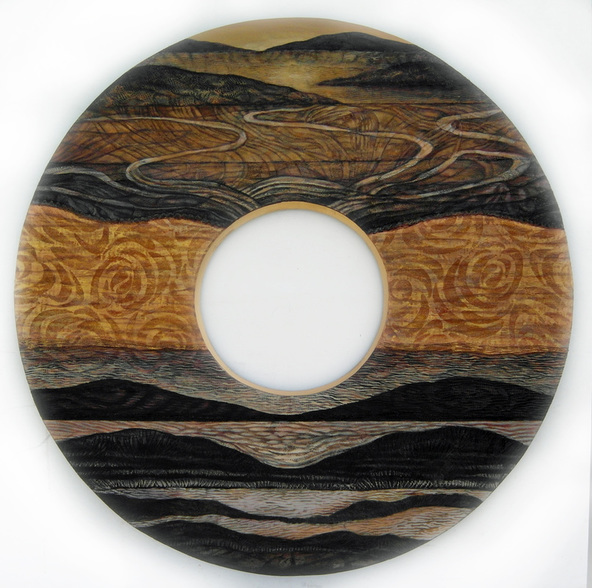 ﻿There is a sense of quiet anticipation in this work which is composed of multiple layers of mountains coming out from the sky in the background. This is the first painting in a new series of three-dimensional mountainscapes. 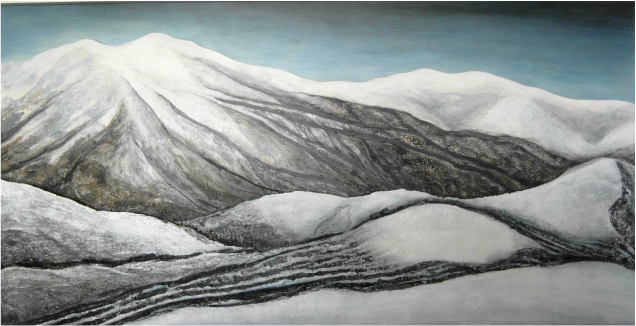 It was inspired by a trip into the heart of Arthur's Pass after heavy snowfall. 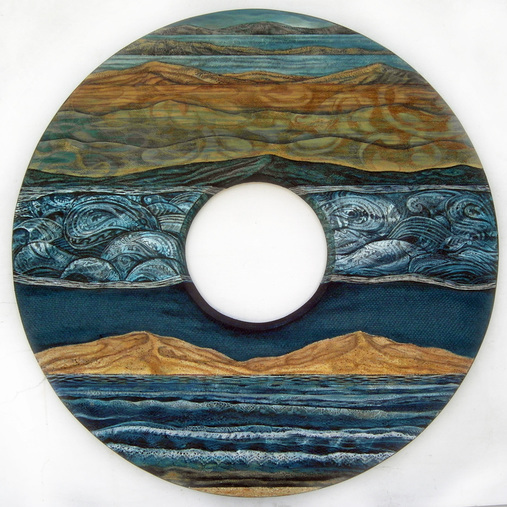 Blue Tahuna showcases the artistry of water as it blends and shifts the sands of our landscape. This work evokes the golden atmosphere and quiet darkness created by sunset in an estuary landscape. Alluvial Plains conveys a range of vistas within one vision. 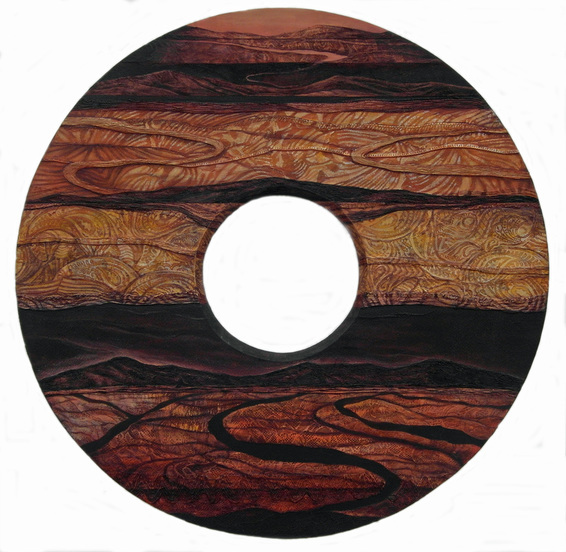 Like a tattoo on skin tells a lineage, so the geographical forms and excavated layers within the painting uncover the riverbed of history and memories within the land. ﻿Geographical forms and excavated layers reveal memories within the land. ‘Sepia Tides’ is an example of this – with the sepia tones of an aged photo, it evokes traces on the land and the tidal flow of history. The lace fabric on the tops of the mountains creates the frosting of recent snow. The side view (see details) most clearly shows the variable levels within this painting. The river trench in the centre is inset behind the river banks. The white ice bands are shaped in wood, raised above the painting surface. 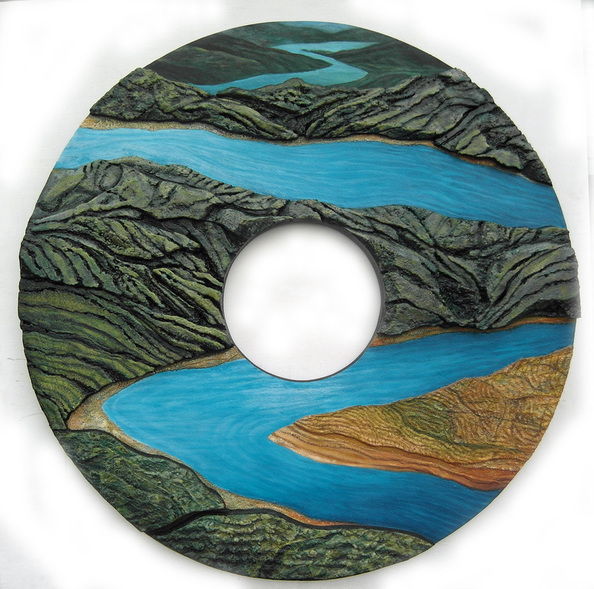 The stunning colour of the water at Hokitika Gorge was the inspiration for this work. The detailed photos more clearly show the raised elements in the work. Sometimes images emerge during the process of painting, and in this case the bird flying over the sea was a happy surprise! ﻿﻿The relief elements in this work were created by chiselling into the wooden panel, as the details show.